In another headline that proves everything I learned as a child was a lie, Jupiter does not orbit the Sun. I initially thought such a claim was outlandish. After all, I was taught in school that all planets orbit the Sun. However, these were the same people who taught me Pluto was a planet, so I decided to look into it further. In reality, none of the planets orbit the sun. All celestial bodies, including the sun, are orbiting around the collective center of mass between them. In order for any of this to make sense, its important to establish a few things. First, Jupiter is huge. The famous “red spot” alone is about 3.5 times the diameter of earth! Additionally, more than 1,300 Earth sized spheres would fit inside Jupiter, and if the mass of all of the other planets in the solar system are added together, Jupiter would still have 2.5 times more mass. 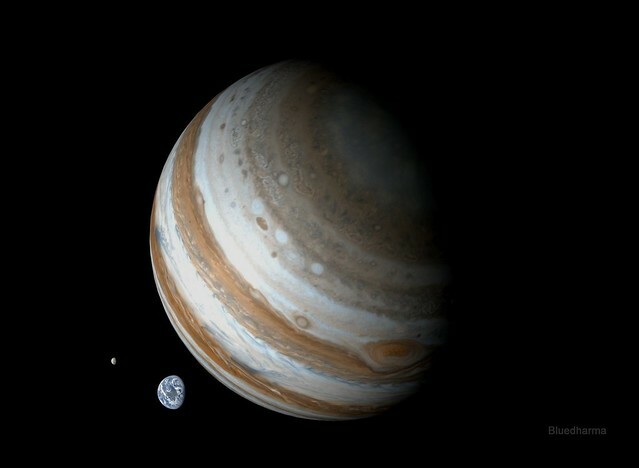 OK, so Jupiter is massive (get it? MASS-ive!) How does that explain why it (or any planet) doesn’t revolve around the Sun? That requires a basic understanding of gravity. Most people think of gravity as “the reason things fall” without realizing how much depth there is on the topic. So, to be more specific, we need an understanding of Einstein’s Theory of Relativity which you can read here. For this conversation, the only vital part to understand is that Einstein demonstrated “gravitational forces” are just warps in the fabric of space and time. The below GIF made this concept very easy for me to visualize. Large objects have a significant impact on smaller objects, but the smaller objects also impact the large ones. A quick example would be the moon’s effect on Earth with the tides. There’s more to it than that, I recently learned about a barycenter which is the center of mass between objects. All bodies in the solar system, including the Sun, are orbiting around the combined barycenter. You read that correctly, the Sun is in orbit!! To understand this concept, it’s helpful to think about each individual planet. Keeping with our earth/moon example, here is what that barycenter looks like (feel free to check out all the fun calculations here). It’s clear that the moon doesn’t actually revolve around the earth, rather both the moon and the earth both revolve around the shared barycenter. Due to the significant difference in mass, it happens to be at a point located within the earth, close to the center. The Earth and the Sun have a similar orbital relationship. For most planets, even the larger ones, the barycenter is so close to the Sun’s center that many ignore it. Which might explain why some think it’s an honest oversimplification to say planets orbit the sun. But let’s call a spade a spade, it’s an egregious lie that needs to be put to rest. The good news is that our solar system has Jupiter. Because of it’s overwhelming size, Jupiter creates a larger impact on the curves in space and time which creates more significant gravitational forces. With so much mass, it’s barycenter with the Sun is actually at a point above the Sun’s surface. The below image and GIF help demonstrate this. The lie told to the kids of my generation can’t escape the headlights of truth from Jupiter!!! However, the mass from all of the objects contained in the solar system are simultaneously affecting each other. Meaning that planetary alignment affects the exact point that everything revolves around. At times, forces from other planets diminish Jupiter’s effect and cause the barycenter of the solar system to be located at a point within the Sun. Other times, the other planets increase the barycenter further above the Sun’s surface beyond what Jupiter can do by itself! In conclusion, I was fed nothing but lies as a child and everything in the solar system orbits the combined center mass. This is also part of the reason Mercury could eventually crash into Earth, but that’s a conversation for another time! Bonus time-table diagram of the solar system’s barycenter over the years in relation to the Sun. Gravitational warp and the bending of space-time also explains what happens when you share a bed with someone much larger than you. Literally laughed out loud!! Awkward because I’m supposed to be working right now.